[By Fred Lynch near Boston, Massachusetts] "Forget the wall. Ignore it." That's what I decided, finally. "And don't draw the cobblestone street either." This intersection of sorts, is one that I've criss-crossed for years in Viterbo. Often, I'd stop and look and wonder if I'd ever draw there. But it had never seemed arresting enough. That's because I'm captivated by contrast—drawn to capturing how light carves up a scene. But the light never shined on this spot, or at least never to my liking. It remained a dank place from the dark ages. Last year, I ditched my need for sun, and drew the scene as a sum of its parts. I dismissed the wall as an essential element and instead, drew a list of the medieval architectural elements of this special place in Central Italy. By doing that, I called attention the things I found so interesting: the parts. Of those parts, particularly special to Viterbo itself and its surroundings, are the profferlo. It's a term I've only recently learned. Profferlo are peculiar staircases of this area, medieval staircases which run parallel to the facade of a building and feature a small balcony at the top. 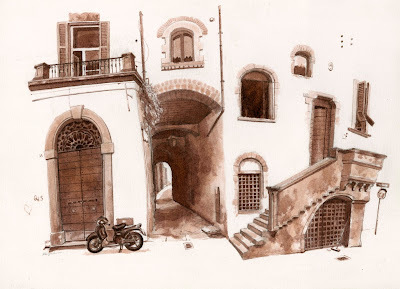 They were a bit of a status symbol as they feature nice stonework, and bring one up to the more desirable second floor—up and away from the filth and noise of the ground level, and watchful streetside sketchers like me.